SAN JOSE – The San Jose Sharks (@SanJoseSharks) today officially announced the Promotional Schedule for their 25th National Hockey League season, which will commence on Oct. 7 at Los Angeles, followed by the team’s home opener at SAP Center on Oct. 10. The team’s 2015-16 Promotional Schedule includes a wide-range of fan giveaways, special promotions and appearances by a variety of former Sharks players. Details on the jersey will be released shortly. Other special nights include a T-shirt giveaway presented by Barracuda Networks on Opening Night (Oct. 10), Comerica Bank Schedule Magnet Giveaway on Oct. 22 and a Joe Pavelski Bobblehead Giveaway presented by SAP on SAP Fan Appreciation Night (April 9). 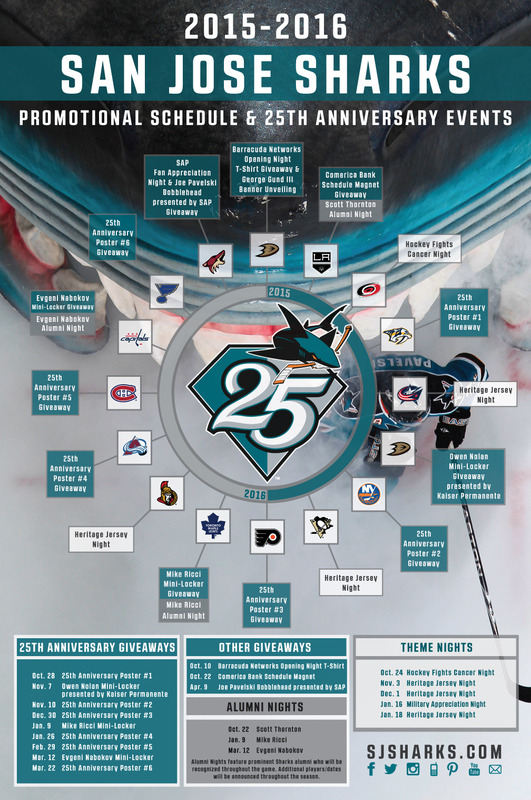 In addition, a special, six-part 25th anniversary poster series featuring artwork by local artists will be distributed, showcasing memorable moments and players from the Sharks history. Get individual game tickets before the public by signing up for a presale opportunity! Click here to sign up now. Sharks fans can also look forward to a three-part alumni mini-locker giveaway series on Nov. 7, Jan. 9, and March 12 featuring three of the most prominent players in Sharks history: Owen Nolan (11/7 vs. ANA), Mike Ricci (1/9 vs. TOR) and Evgeni Nabokov (3/12 vs. WAS). Fans will have the opportunity to re-connect with players from the team’s past as many former members will be brought back to SAP Center and recognized. Several dates have been confirmed, with many more to be announced in the coming weeks. Confirmed attendees include; Scott Thornton (Oct. 22), Ricci (Jan. 9) and Nabokov (March 12). Alumni Nights will include a brief pre-game video tribute, dropping of the ceremonial first puck and visits to the Sharks television and radio broadcasts. In the days surrounding the alumni game night, the former players will also engage with fans and the community. Throughout the 2015-16 National Hockey League season, the San Jose Sharks will honor and fondly recall their historic and proud past, including; the team’s inception in 1991; the global frenzy created by the team’s renowned logo and revolutionary use of the color teal; the long list of talented players and characters that have worn the Sharks sweater; the impact the San Jose Sharks have had on the City of San Jose and its surrounding communities; the immense growth of the game of hockey in the Bay Area; and most importantly, the unbridled support and passion of Sharks fans all across the globe. A wide variety of Sharks-themed 25th anniversary merchandise is available at the Sharks Store at SAP Center.